Everyone is afraid of something. It’s those fears that hold you back, control your thoughts, and make you worry. But what if you didn’t have that fear? What if YOU, instead of fear, controlled your thoughts, your actions, your reactions? 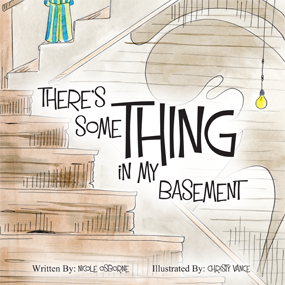 There’s Something in My Basement is about a boy who is afraid. He has no control over his thoughts or actions, and he can’t seem to figure out what to do. In a moment of weakness, he panics! His mind races with crazy scenarios, his body is shaking, his heart pounding, and he runs away…as fast as he can. In the end, he’s able to uncover the truth. Imagine his surprise when he finds somethings aren’t always what they seem.